By Mark McCluskey, Swimming World College Intern. There has recently been a change in the tide when it comes to people’s eating habits. In the past couple of years, the world has become much more observant of what they eat and drink every day. As people watch what they eat, they are beginning to realize that diets such as vegetarianism and veganism are incredibly healthy ways to eat. According to foodrevolution.org, there has been a 600% increase in people identifying as vegans in the United States in just the past three years. Obviously, this is a steadily growing trend. The issue is that some athletes, especially swimmers, sometimes are nervous to go vegan, as they are worried that it will affect their performance in a bad way. There is a stigma around veganism that those who decide to do so are weaker and more frail because they aren’t getting enough nutrients. Often, you will hear athletes say that they need protein and carbohydrates, so a vegan diet will be more detrimental than helpful. This could not be more incorrect. As long as a swimmer is smart about it, they can transition into a vegan diet that will actually increase their performance in the pool. Plenty of athletes have made the decision to become vegan to improve their athletic performance. Specifically, in the NFL, the trend of going vegan caught on last season when it was reported that Tom Brady, quarterback for the New England Patriots and one of the players with the most longevity in the game today, was following an approximately 80% vegan diet by The Boston Globe. Many players followed his lead, and the results were widely reported. Wesley Woodyward, a player for the Tennessee Titans, was interviewed by the Associated Press last year and discussed how his energy was at an all-time high; his only qualm was that he was having trouble gaining weight – something that swimmers do not tend to want anyway. There are even vegans in the swimming world. Murray Rose, an Olympic swimmer in the 1950s and 1960s, was nicknamed the “Seaweed Streak” because of his choice to eat only vegan and still dominate his competition. MenSa Eggleston, a swimmer for Howard University, wants people to know that being a vegan swimmer is very possible. Being a vegan his entire life, Eggleston explains that “being a vegan has not hindered my ability as a swimmer at all. 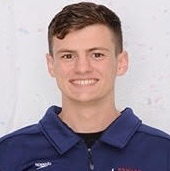 I have been able to swim and improve my speed over the course of ten years to the point where I was recruited to a Division I program – one of the highest levels a swimmer can go”. The important part of an athlete drastically changing their diet in this way is to do it in a smart way. If you plan to try being vegan, do not keep going to McDonald’s and get two servings of French fries instead of fries and a burger. Just because you are not eating meat does not mean that you are automatically eating healthy. It is important to know what types of foods will get you certain nutrients. As mentioned before, many swimmers’ main worry is that they will not be getting enough protein to sustain the amount of work they are putting into the pool. In a study done by David Rogerson in the Journal of International Society of Sports Nutrition, great replacements to the protein you’d get from meat are discussed. Some of his suggestions for high protein foods include pumpkin seeds, lentils, and black beans, among several others. For swimmers specifically, Eggleston recommends vegan protein shakes and bars, saying “there are many vegan plant based protein powders and bars available in stores. Not only that, but regular trail mix is full of proteins and other nutrients that swimmers look for”. Eggleston also agreed with Rogerson recommending black beans as a valuable source of protein and carbohydrates. All a new vegan needs to do is research the nutrients they need to stay strong and they can make veganism improve their performance. Many schools offer nutrition counseling, so be sure to look for resources and supportive people who can adequately monitor your diet. When making a change in your diet, it is important to do so in a safe and healthy manner. If you decide to go vegan, it may take your body a bit of time to adjust, so try to avoid making the transition close to a championship meet, as your body may feel a bit tired for the first couple of days. Following a diet is a training strategy, so it is a waste of time to do it in order to swim faster at an upcoming meet and would end up hurting your performance. As veganism is becoming increasingly popular throughout the world, many people are re-thinking their eating habits. Athletes do not need to worry about becoming consistently frail or tired from becoming a vegan. On the contrary, being a vegan can actually be really helpful to a swimmer looking for an extra boost in their training, performance and overall health next season. While not every athlete chooses to go vegan, everyone can choose healthier, more nutrient-dense options to stay fueled for competition. Would you consider eating vegan?